Our understanding of the structure of matter was revolutionized in 1964 when American physicist, Murray Gell-Mann, proposed that a category of particles known as baryons, which includes protons and neutrons, are comprised of three fractionally charged objects called quarks, and that another category, mesons, formed of quark-antiquark pairs. Gell-Mann was awarded the Nobel Prize in physics for this work in 1969. This quark model also allows the existence of other quark composite states, such as pentaquarks composed of four quarks and an antiquark. Until now, however, no conclusive evidence for pentaquarks had been seen. 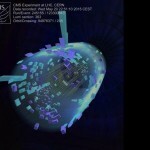 The LHCb team at CERN has now found evidence to support this theory. Earlier experiments that have searched for pentaquarks have proved inconclusive. Where the LHCb experiment differs is that it has been able to look for pentaquarks from many perspectives, with all pointing to the same conclusion. It’s as if the previous searches were looking for silhouettes in the dark, whereas LHCb conducted the search with the lights on, and from all angles. 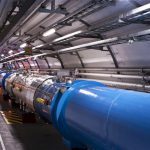 “Benefitting from the large data set provided by the LHC, and the excellent precision of our detector, we have examined all possibilities for these signals, and conclude that they can only be explained by pentaquark states”, says LHCb physicist Tomasz Skwarnicki of Syracuse University. 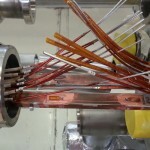 The five quarks might be tightly bonded (top). They might also be assembled into a meson (one quark and one antiquark) and a baryon (three quarks), weakly bonded together. More studies will be needed to distinguish between these possibilities, and to see what else pentaquarks can teach us. The new data that LHCb will collect in LHC run 2 will allow progress to be made on these questions.